Portinatx, Ibiza. This beautiful bay with crystaline water is very popular with snorkellers and photographers. Getting there: Reached only by car on the road to Portinatx. There is a parking but space is limited, so do come early. Steep access road. The beautiful bay of Cala Xarraca with its crystaline water is perfect for snorkellers and a favourite with photographers. At only 90 metres long and 15 metres wide, this is one of the most isolated bays in Ibiza, boasting the most magnificent of views. It is surrounded by lush green pine forests dotted with white houses, rugged red cliffs and rocky pathways which make it ideal for adventure walks and exploring. 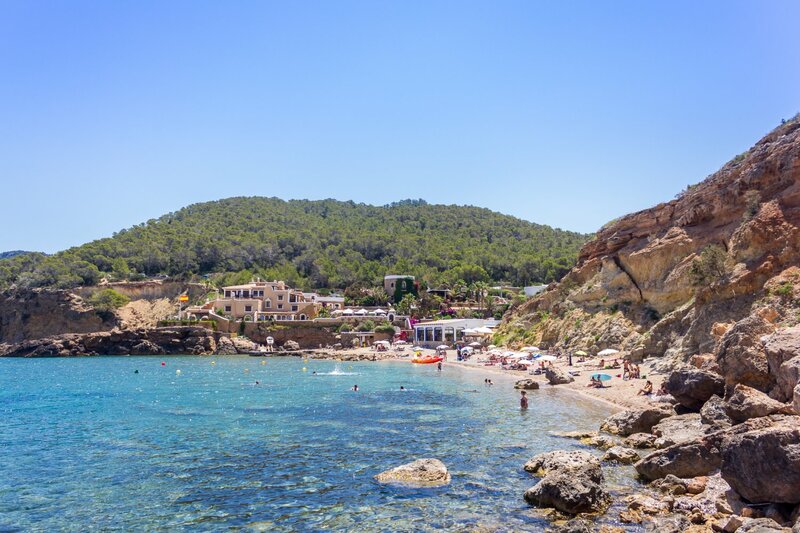 Cala Xarraca is divided into three areas; the middle is the busiest and most popular, with the two smaller areas to either side being more secluded and tending to attract nudists. Tip: A unique feature of Cala Xarraca is its natural mud bath, which can be found to the left of the bay. This is said to have healing properties for the body, and has been known to soothe tired skin. There is only one restaurant, the aptly named Cala Xarraca, which has been run by the Tur family for over thirty years, and offers a variety of excellent food. Specialties include fresh fish and rice dishes. Nearest resort: Portinatx with a very good choice of hotels and apartments. Alternatively, go for a private holiday villa, there are many gems hidden in the green hills surrounding San Juan.